Although this canopic jar was intended for a funerary context, the face on the lid was carved by a master with the skill and care one might expect in a more public portrait. Whatever the age of the owner at her death, she was given a youthful countenance for the eternal afterlife. The shape of the face, with its long slender nose, sloe eyes, and sensuous mouth, identifies it as a product of the latter half of the Amarna period. The jar and lid were altered in antiquity, making it extremely difficult to identify the original owner. The striking face carved on the jar lid represents one of the royal women of Amarna. 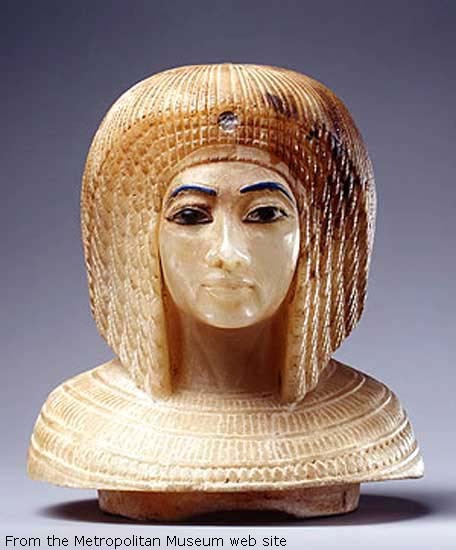 Her hairstyle of overlapping curls, known as the Nubian wig, was worn only by adults and was popular among the female members of Akhenaten's family. The hole at the centre of the forehead once secured the separately carved upper body of a rearing cobra whose tail is visible across the top of the wig. This royal protector was exclusively worn by kings and queens. Since its discovery in 1907, the face has been variously identified as that of Queen Tiye, Akhenaten's mother; Queen Nefertiti, his principal wife; Queen Kiya, his beloved secondary wife; and Princess Merytaten, his eldest daughter. For a time, it was even identified as Akhenaten himself. This confusion is understandable, since the inscription identifying the owner was almost completely erased. Faint traces of hieroglyphs indicate that the jar was originally inscribed for Kiya, and the Nubian wig is most frequently associated with this queen. In some respects, however, the face more closely resembles later representations of Tiye, and it is possible that the lid originally belonged to her burial equipment and was later placed on Kiya's canopic jar. The tomb in which the jar was found, KV55 in the Valley of the Kings, is probably the most controversial of all Egyptian tombs. It contained burial equipment inscribed for Queen Tiye and magical bricks with the name of Akhenaten. There were also four canopic jars (including this one) and an inlaid wooden coffin almost certainly made for Kiya. It appears that, for safekeeping, Tutankhamun had this material transferred to Thebes from Akhenaten's tomb at Amarna, which seems to have been plundered soon after Akhenaten's death. The jars and coffin of Kiya may have been reused at that time for the burial of another member of the royal family. For more information on the other jars in this set housed in the Cairo Museum, click here. For more information on the Coffin also found in KV55 and an article titled Has Akhenaten's body been found..?, click here.